Designer Collaboration: Alice + Olivia for Starbucks ~ Caviar Taste, Tuna Fish Wallet. New Flash: Wearing a 'tutu' to work is no longer socially unacceptable! Starbucks and Stacey Bendet, founder and designer of Alice + Olivia, have teamed up for an unBEARably chic limited-edition holiday collection. 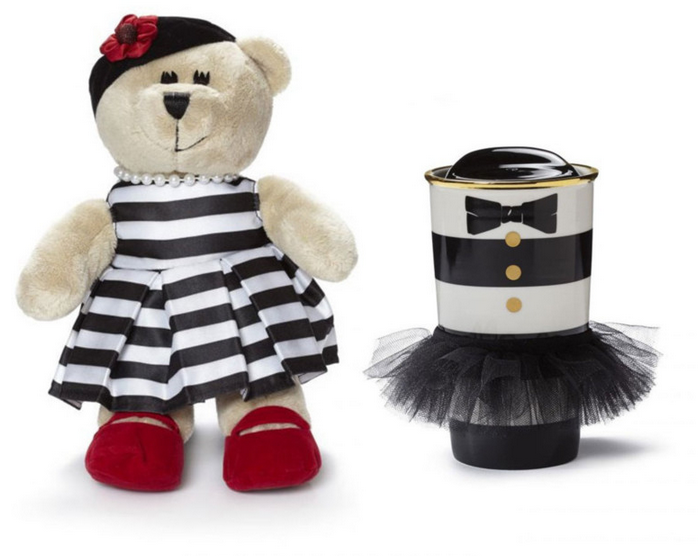 The two-item collection features the Double Wall Ceramic 'Tutu' Tumbler and 'Bearista' Bear, pictured above. The collection will be available at StarbucksStore.com on November 1st, and in stores beginning November 12th. Both items are priced at $19.95. I WANT that tumbler!!!! AHH! NOPE. I can't. I need the stripey tutu mug now. A mug wearing a tutu! How can I resist that!